Boost Mod adds boots to your game that increase your speed. This mod is a part of the Micro Series. Boost boots are the lowest tier of boots in this mod. They give a 25% (Configurable) increase to the player’s speed and give the same damage resistance as leather armour but are slightly more durable. Swift boots give a 40% (Configurable) increase to the player’s speed, give a slight jump height increase and also allow the player to step over a block (Configurable). Swift boots give the same damage resistance as leather armour but are slightly more durable. 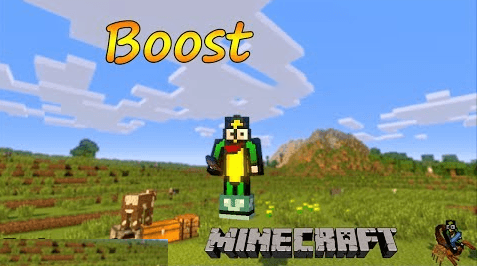 Swift armoured boots give the same bonus to the player’s speed as swift boots and also give a slight jump height increase. These boots come in iron, gold, and diamond and give the same damage resistance as their vanilla counter parts.